Amazing D.I.Y. Wedding Invite Ideas! …many thanks to Lucy Bennett at a PracticalWedding.com! There’s huge variety when it comes to the execution of invitations these days, so before you start buying paper or ink, you need to think about the final form of your invite: how will it look, and what process do you want to use to make it? Here are just a few options, and their pros and cons. DESIGNING YOUR OWN: If you’re choosing to design your own invitations, you probably have a good idea of what you’re hoping it will look like. You might even have a grasp of some of the skills you’ll be bringing to the table to make that vision a reality. Or, you’re hoping to learn a little more about the process and designing in general. Or maybe you just want to get a little crafty. All of these reasons, and more, are good reasons to do your own invites. We’ve got a whole bunch of extra tutorials, in case you want to brush up on a few skills before you put proverbial pen to paper. BUYING/FINDING A DESIGN: If you don’t have design experience, and you’re not fond of pushing images and text around on pages (aka, does the idea of designing a flyer for a Bake Sale or some other event excite you, or does it make you hide under your desk? ), you’re going to need to find someone to design it for you. Fear not! Thanks to the Internet (and Etsy, bless), there are tons of places to get an invitation design. Some are even our sponsors! Here’s a short list of places to check out. There’s enough variety in paper types, weights, and finishes to make your head spin and keep you busy for weeks. 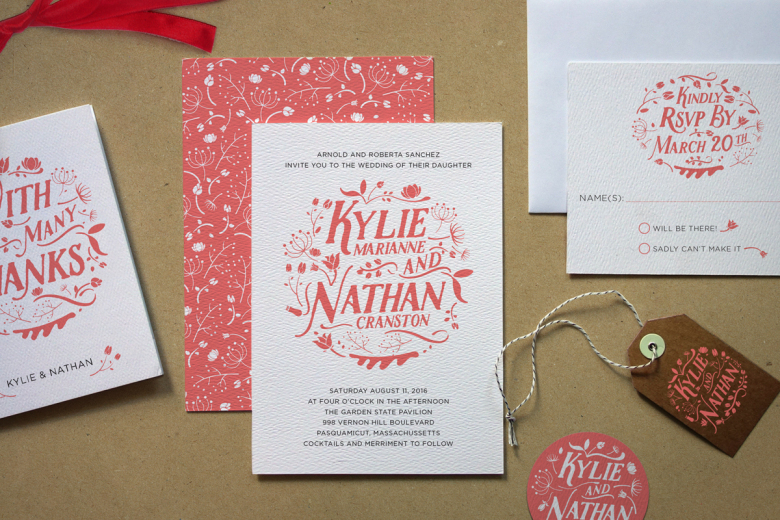 Here’s the basics on what you need to know for choosing what paper you’ll print your invitations on. If you’re buying your own paper, you can find a good selection at local office shops when it comes to card stocks and glossy photo paper. However, if you’re looking for linens or specialty papers, you may have to go online. Always get a sample before buying a huge stack of paper, and do a test print, to make sure that who ever or where ever you’re printing from can actually use the paper you’ve selected with your design and medium. Here are a few other places to buy paper from. PAPER CUTTING: The Internet loves to tell you that if you are doing your own invitations, you need to invest in a professional paper cutter, or at least a rotary cutter, along with a tape gun, and the list goes on. You can skip this by ordering paper that’s cut to size—always double check to make sure you can print said format of course—and skipping any taped on embellishments. I promise, a fancy invitation need not have three layers of cardstock and the ability to stand on its own.